Single stage units with the key filter unit internally mounted to the discharge pipe as shown. 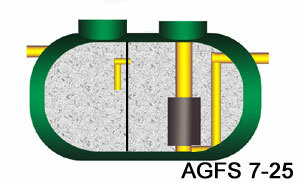 Two chamber units separated by a baffle, designed to enhance sludge separation, the first chamber restraining most of the heavier fats and greases depending on the temperature of the influent. All units come with a 110mm spigot for venting by others. Standard inverts are shown below. Deeper inverts can be accommodated, details upon request. The grease separators are designed to be installed in full concrete surround in accordance with Aluline Environmental Solutions guidelines (available upon request). GFS Range Nominal Size 1 to 25.